While Antony Hurden had the idea for Schrödinger’s Clock®, he would like to acknowledge contributions from many others. Mark Skinner – design and development of the App, image and audio file editing, and this web site. Also for useful discussions in refining the original concept. Julia Mitchell – for the photograph of the church clock in Wilmington, Vermont. 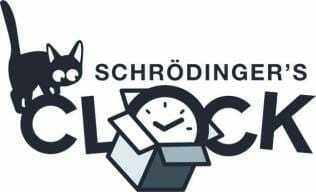 Special Agent Associates Ltd – for the images, advice on branding, and producing the prototype of Schrödinger’s Clock®. Also for useful discussions in refining the original concept. IP21 Ltd – for handling the patent, trade mark, and copyright issues. St Edmundsbury Heritage Services – for information on Brock’s regulator and allowing the recording of the escapement.